One of my recipes is included in this month's VegWorld Magazine. You have to check out this amazing magazine. It's loaded with recipes, education, stories, product reviews, etc. You will love it! Add 2 1/2 cups water and 1 cup of farro to a saucepan, bring to a boil, then simmer for 25-40 minutes until it reaches an al dente texture. 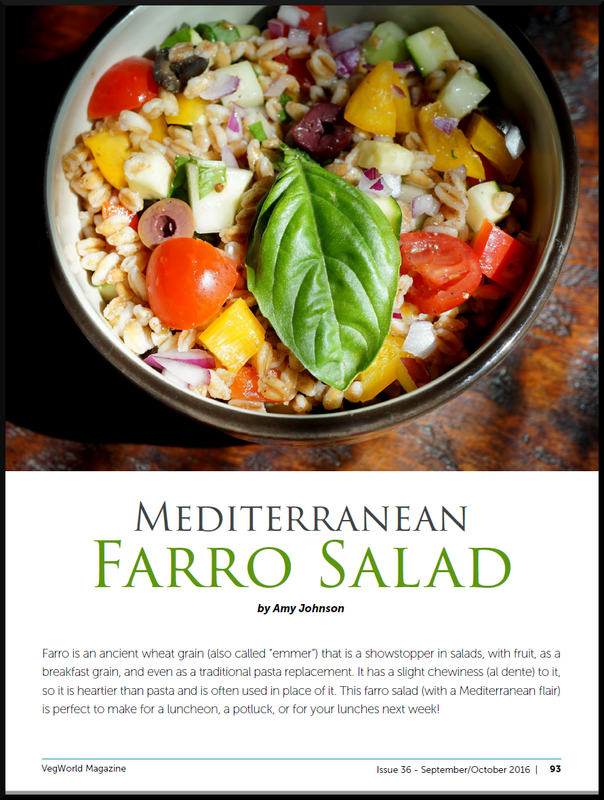 This will probably make more than you need, but the yield varies in size so you want to make sure you have enough for the recipe (1 ½ cups of cooked farro). 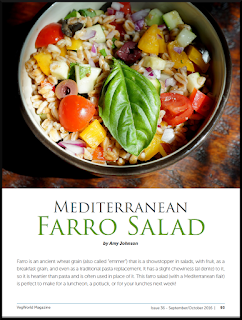 In a large bowl or container, combine cooked and cooled farro with the cucumber, zucchini, peppers, tomatoes, olives and basil. In a small cup-style blender, combine the dressing ingredients and blend until the date is pulverized well. Pour the dressing into the salad and stir well to coat. Add salt and pepper to taste. Refrigerate before serving.